I believe that hiking is very good for your mind and your body. Hiking lighter can give you the option to hiker further and longer. – What is further and longer you may ask? For me it’s going further with less. Being lighter I can walk further without putting more strain on my body and feet. Longer being both agewise and kilometers. I also try to pick gear that fits the above statement and also are environmental friendly and sustainable. At Lighter Packs you’ll find information about trails, planning and gear. I try to write trip reports and reviews when I have some value to add. I try to keep all of my platforms advertisement free for your pleasure. If you want to ask me something, just drop a comment down below! If you want to get in touch please use the contact form below, thanks! Does the handset connections work or are they just dummies? This might be waaay too late, but do you still have those faceplates? I will probably be able to help you with that soon. Nej det har jag inte. Sålde den tillförmån för någon mindre väska. Väskan i sig var av bra byggkvalité och rätt bekväm att ha på ryggen. Sorry for necroposting, but do you still have 117 faceplate for sale? Har du provat denna, har 1.0 versionen. Lättaste men fortfarande ram smat fullt justerbar. Nix den har jag inte testat. Ser ut som en trevlig rygga men för de vikterna som jag normalt bär omkring på så blir det bärsystemet allt för lyxigt vilket gör att vikten på ryggan sticker iväg. Jag kollar på en ryggsäck som väger kring 400g eftersom den jag har idag väger runt 900g. Hi, I am Kyle from the YouTube Channel GoPro Tips and Tricks. Yeah, sure, no problem at all. Thanks for getting back to me regarding the picture. Keep up the good work with your YouTube channel! I Came across your video on Jotunheimen and was really impressed. I am a mountain guide (as a hobby), in the UK and am planning a trip to Jotunheimen this year. I have of course had a huge look around the internet for all the basics, yet I just can’t decide on time of year. Of course I see all the literature about ‘when to go’, but with a family and work, my options are either for First week September, or wait till next year, any thoughts? Cheers, Tim. There’s an English version so you should be ok. Don’t know if everything is translated to English though. When I was looking for a travel date September should be ok, you might have some more fast shifting weather than if you go in July/August as I did. The trails should also be less populated in September even though they weren’t anywhere near cramped when I was there. 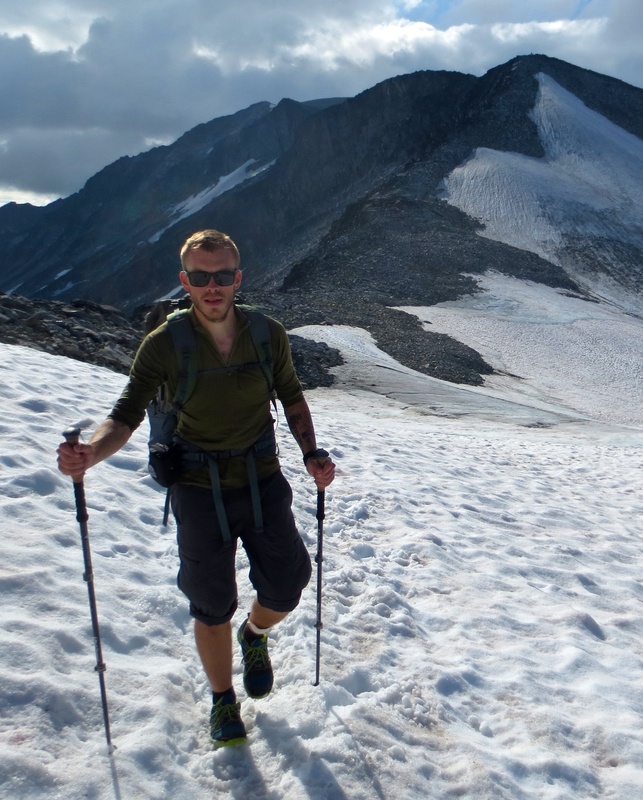 The most popular trails in Jotunheimen are Besseggen (everyone walks here) and Galdhopiggen depending on weather. Great blog, Andre! I love the focus on ul gear! Lots of great photos as well! Thanks Drew! I’ve stopped by your blog a few times before, great stuff in there. Thanks for the kind words. Thanks, Andre! I look forward to seeing more posts in the future! Tältet som används är ett Hyperlite Mountain Gear (HMG) UltaMid 2 som du kan hitta om du följer länken. Det kostar en del men det är värt varenda krona! Notera att du måste ha bra vandringsstavar för att hålla uppe tältet, gärna med “Flicklock system”. Black Diamond är de bästa på marknaden där. Har man inte flicklock varianter är risken stor att stavarna trycks ihop under hård vind då Cuben Fiber materialet inte har någon stretch i sig som Silnylon. Eftersom det inte stretchar så tar det inte heller upp någon väta och blir tyngre under vandringen. Smart! Hi:) i see that you have the cumulus quilt. Would you say that this suits a side-sleeper/wide-sleeper? I am 177cm and 85kg. Want a quilt for temperatures above 0 degree celsius. And if it gets colder, i can put some warm clothes on. Cumulus can make this wider, with 10cm or 22cm. 2. Should have them make a wider quilt for me, so i dont get cold spots? 3. Do i need them to make it longer? Yes I indeed do have one of those and I’m quite like you in that sense that I use it in the same way. You’re about 9cm longer than I am and a bit heavier. You should most certainly go for a longer version, I think the Cumulus website states that too. I have the normal one and that suits me just fine but for you I think it’ll be too short. About width I’m not sure if you need to get a wider one. For me the standard is good enough and I don’t feel cramped when sleeping in it. Maybe you should contact Cumulus about that? Their customer service is really good. Regarding warmth, that’s totally up to you. Personal preference. I use the 250 and that’s good for me. Hi, just to add to this I have one of the Cumulus comforter square quilts. I have their M350 version rated to -4C I got that for its super versatility through both summer and winter. In summer you can just have it fully open (square) so it’s easy to kick it off and on to regulate heat. In winter I tested it in a back garden test one night to -6C with it fully synched up and we just slept under a tarp so fully open sided to the still cold night. It worked just fine with an extra layer on underneath. Great quality products from cumulus really pleased with it. I use it with a thermarest xtherm mattress so it’s a great system for all seasons. Looks nice, for me personally I like the quilt but that’s because I generally have cold feet. Planing a trip on the John Bauer trail in early October. We won’t be able to cover the full trail as we only have 2 days. Can you recommend the most beautiful spot on the trail? I’d say that the most beautiful part of the trial is in the North going from Gränna through Röttle. Are there any other trails up there, in that area (about 2-4 hours from Helsingborg) that you can recommend too? Looking for inspiration and it’s always nice to hear it from other people that have enjoyed their trips. I like Omberg. That’s about an extra hour North of Gränna. I live over on the west coast of Norway just outside of Bergen and have recently found your blog and read a few articles. Specifically I wondered if I could ask for some help regarding your Hyperlite ultamid? I am considering making my own ultra light tent using silnylon but the design of which I’m thinking to base quite heavily on the ultamid as I like their design, I’ve also been looking closely at the Mountain Laurel Designs and Locus gear in Japan. Specifically I’m trying to gather more information on how to form the top peak on these tents and how they are fabricated and sewn together so it looks clean and well made. I know the Hyperlite is cuben fibre but the principals are the same, and I know they are also reinforced in the peak using dyneema ripstop which I too plan to use for mine. Your help? I wondered if you can take some quite detailed photos of the peak of your ultamid for me both inside and out so I can see how its made / folded / stitched or indeed welded seeing as its cuben fibre. I think you should go on trek-lite.com and ask there. A lot of members are making their own tents and you’ll probably get better info from them rather than asking me to be completely honest. Good luck! I’m writing to ask for some advice on places to visit in Sweden and Norway. I plan to spend 3-4 months bikepacking/off road bike camping/villmarkssykling – I’ll be travelling light and fully equipped camping gear – and really enjoy open wilderness, forest, mountains, and a great diverse range of landscapes. I also know cycling is off limits in National parks of Norway and presume this is the same for Sweden; I am also told I can follow existing trekking routes by bike but I also think these will be busy in Summer (I’ll be visiting from June to September) and so maybe off trail is best? It seems you do not cycle but I’m more interested in your overall experience of landscapes and great places to visit in these countries. Can you give me a rough idea of some areas, places, routes, and landscapes I should see. I like a bit of a challenge but cannot directly ride up mountains…yet! You can maybe google translate the site which will help but click near the top where it says ‘kart’ in Norwegian this is Map. You can then see various routes over the whole of Norway for walking, biking, paddling…. etc. That link that Chris posted is quite good for Norway. The Swedish fells are quite available for biking as far as I know. Not really tuned in to that thing so I can’t really comment. I did however see many tracks of bikes when I visited Vålådalen last summer. The Swedish Tourist Association might be of help for finding good tracks to ride. Was starting to plan my route for TGO’18 and was searching online for guidance on OS Maps vs. Viewranger. Thrilled to find your vlog — thanks! I’m glad you found it useful. Make sure to check out both apps if you intend to carry your phone as a GPS for the hike. Thanks Andre. I’m inclined not to use GPS, in which case I will probably just use OS Maps for route planning. Hope to cross paths! Speaking from experience, I’d still recommend having the option to in a bad weather/visibility situation as Scotland is quite flat and therefore it’s harder to take bearings if it comes to that. Hejsan, du har dun skor med dig under visa av dina vandringar. Hur är dessa, blir dina fötter kalla ändå? Några andra saker man ska tänka på med dem? Hej, detta är ju väldigt individuellt. Jag kommer enbart att sova med dem så de ersätter mina traditionella raggsockar jag brukar ha på fötterna. Jag brukar i regel inte frysa nämnvärt om fötterna. Det finns ju olika tjocka dunskor att välja på. Jag har tagit lätta och korta utifrån min erfarenhet. Nackdelen kan ju vara om man svettas mycket om fötterna eftersom det är dun. Dunet har ju större risk att börja klumpa ihop sig över tid och tappa funktionen. Då får man lufta dem och fördela dunet igen. Detta är ju inget som kanske händer på en helgvandring men denna risken finns ju inte med ett par ullstrumpor. Så håll dem torra, precis som sovsäcken är väl vad man bör tänka på.